Faa Sai is one of the most playful elephants at the Elephant Nature Park in Thailand. One of her favorite activities is frolicking in the park’s sprinklers. She just loves to splash and roll in the water over and over again. So much so that her caretakers said that she “accidentally” broke the sprinkler … again. Whoopsie! But that’s alright because the gushing water just makes this game even more fun! Watch how she dives into the geyser, having a ball. It’s so heartwarming to see Faa Sai having a blast after the troubled life she’s experienced. This 14-year-old girl, whose name means “Clear Sky After Storm,” was stolen from her mother in the wild as a baby, and then forced to endure cruel torture training so she could perform in the tourism industry. However, at Elephant Nature Park, she has made a full recovery and is now a happy, well-adjusted, confident young female, who simply loves to have a good time. Save Elephant Foundation is a Thai non–profit organization dedicated to providing care and assistance to Thailand’s elephant population through a multifaceted approach involving local community outreach, rescue and rehabilitation programs, and educational ecotourism operations. 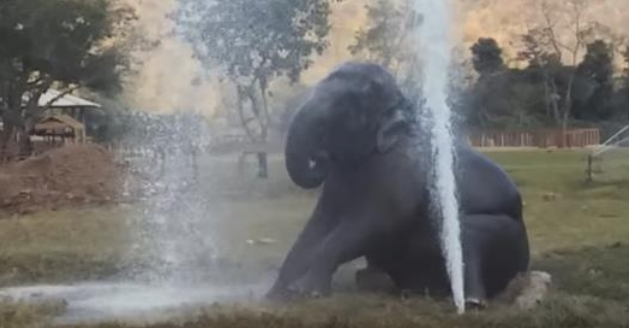 Responses to "Elephant Loves Her Sprinkler So Much, She Broke it … Again "